A recent topic of much interest in causal inference is model selection. 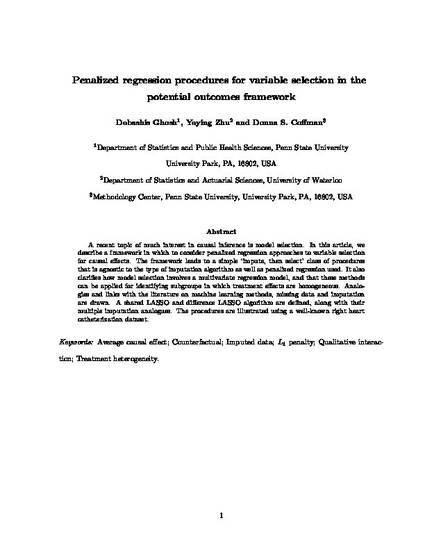 In this article, we describe a framework in which to consider penalized regression approaches to variable selection for causal effects. The framework leads to a simple `impute, then select' class of procedures that is agnostic to the type of imputation algorithm as well as penalized regression used. It also clarifies how model selection involves a multivariate regression model, and that these methods can be applied for identifying subgroups in which treatment effects are homogeneous. Analogies and links with the literature on machine learning methods, missing data and imputation are drawn. A shared LASSO and difference LASSO algorithm are defined, along with their multiple imputation analogues. The procedures are illustrated using a well-known right heart catheterization dataset. imputed data; L1 penalty; qualitative interaction; treatment heterogeneity.